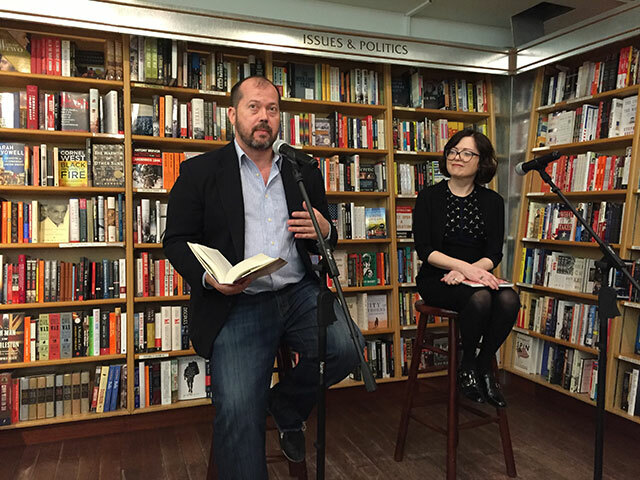 Alexander Chee launched his latest novel, The Queen of the Night, last week at McNally Jackson Books. The novel follows Parisian opera singer Lilliet Berne on a personal adventure through her past mysteries. Chee spoke with his friend, the critic Maud Newton, about the book and the process of writing it over the last fifteen years. Newton was one of Chee’s early readers. She read it one weekend and expressed enthusiasm that Chee didn’t trust. “I feel like novels are something you come down with like an illness and writing them is the cure,” Chee says. While writing the novel he says he felt in over his head and incredibly nervous. He worried about finishing the novel. At a certain point though, the humiliation of not finishing the novel becomes too great. He did worry that he had chosen a too esoteric subject. Opera singers of the era were revered in the same way modern pop stars are. Chee says he found that obsessive fandom fascinating, as did the customs of the time period. Many of the customs of the French Second Empire remain common to celebrities today. For instance, the idea of never wearing the same dress twice on the red carpet originates in this period. The Queen would insist that ladies in her court never wear the same article of clothing twice in her presence. Often she would require multiple changes of clothing every day so that ladies spending a week with the court might need thirty dresses. Chee decided to populate Lilliet’s life with famous people. He began by asking himself the questions who would she speak with, sleep with, eat with. In Lilliet’s background there is a scandal and a secret. The novel traces her confrontation with that scandal. The ending was the first thing Chee wrote. From there he wrote several large sections of retrospective story. The challenge of the novel came from reconciling the various sections he had written. David Rakoff inspired the story when the two ran into each on the street. Rakoff always had some interesting and random story to share. Rakoff told Chee about the opera singer Jenny Lind, a 19th-century opera star. Chee says Jenny Lind was a kind of 19th-century Cher. When Lind finally retired, she did a farewell tour that lasted two years to sell out crowds. Rakoff first told Chee about Jenny Lind in 1999 and he has worked on the novel for most of the time since. Chee had the benefit of many people weighing in on on the manuscript. “You find your readers along the way,” he says, adding that he tries to have a mix of of the type of people reading his work. Each brings a different concern. For instance, he was in a laundromat trying to decide whether he was actually going to write a book about a 19th-century opera singer. He described it to the woman working at the laundromat and she said, sure, she would read a book like that. Chee did explain how he kept track of writing such a long novel over a decade and a half. He kept a journal in a Word file describing what he wrote each day, where he left off, and what he covered. He wrote it in a blog-chronology with the most recent entry at the top of the page. Each day would begin and end with the journal. He also had a list of characters. He also kept was a separate Word file of discarded writing. At one point, the discarded file contained more than 300 pages but the active draft file had only 70. Later he came back and pulled some of those older ideas into the novel. “I think I was rejecting things I wasn’t ready to use,” he explains.